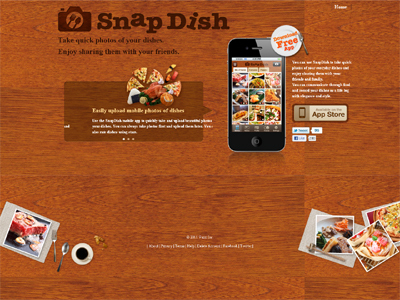 Snapdish is a free iPhone app and a quick and easy way to take beautiful food photos and sharing them. Take a snap of your favorite dish and process it to make it look more appetizing. When your photo is ready to post, share it on Facebook, Twitter and other social networks. You also have the option of adding a location tag and checking into Foursquare automatically. Many food photo sharing services are centered around restaurants and for dining out. We are purely a food photo sharing service so food cooked at home or even veggies growing in your garden can be the subject. An app for the true food lover. There is no other mobile social app that does any kind of food, whether it be from a restaurant or food cooked at home.